I saw a performance of the Guerilla Girls last spring. One of them was named Julia Child. This is her portrait. For me, this drawing illustrates the concept of the monstrous feminine, which examines the primal power of women. 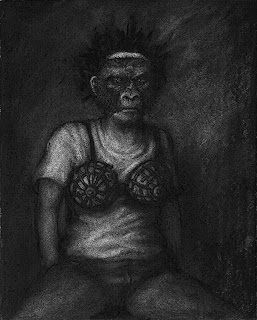 For this reason, I am posting it for Illustration Friday's topic for the week, which is "Primitive". I like that. Pretty cool. I like the honesty and darkness in this illustration. I feel like this everytime I have to get undress in a changing room.